Huawei is turning out to be a big contender in the smartphone market after releasing many number of devices which have been accepted well by the users. There is one problem which was reported by many of the Huawei smart phone users about the software updates which were very late. So here is some good news for Huawei smartphone users as the company has just announced the list of devices which will be getting Lollipop update and time frame in which the devices will be receiving the same. Huawei is going to announce Ascend P8 shortly and this news about the Lollipop update was released which show that most of the devices released in 2014 by Huawei will be getting the Lollipop update. According to the list shown in the image below the devices Ascend Mate 7, Ascend Mate 2, Ascend P7 and Ascend G7 are one of the first devices to be getting the Lollipop software update. There is no exact date of the launch of the device but a time frame in which the devices will be getting the update which is sometime next month. One strange thing which I noticed was that devices like the Honor 6 and Honor 4X which are running on EMUI 3.0 on Android 4.4.4 KitKat have not been included in the list of devices to get the Lollipop update in the first batch and some devices like the Ascend Mate 2 are getting a direct upgrade to Lollipop from Android Jelly Bean 4.3 making the latest devices by Huawei wait for the update a bit more longer. 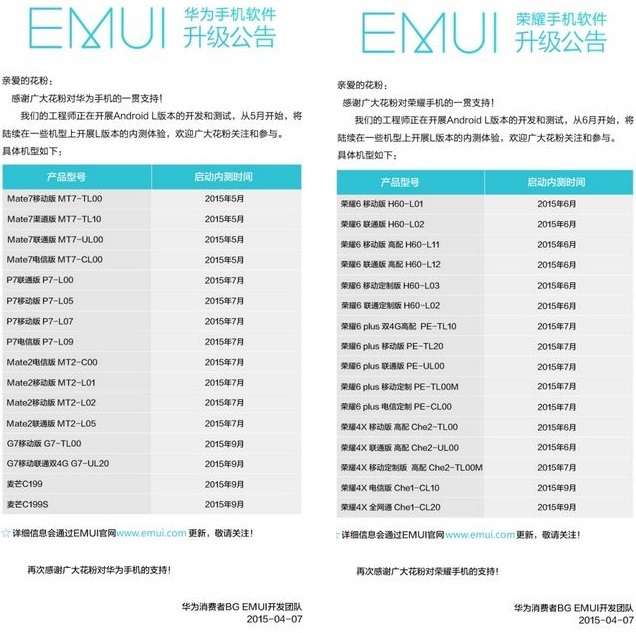 The list of devices getting the software update is seen in Chinese lauguage but we can make out the device model which is in English and also the Year and the month of the Android L release in the particular phones.